Musicology seems an obvious word—how better to describe the study of music? However, as it became apparent that the field dealt almost exclusively with European art music, ethnomusicology was pressed into service. At first, it was an umbrella term charged with the task of surveying all the rest of the world's music. Later, the field expanded, at least in some minds, to include even European art music. Ethnomusicological investigations into the music of the world and the ages prompted a search for musical universals, which were rarely found or agreed upon. The hunt for musical universals has largely shifted to the cognitive level. In addition to the topics of music cognition, perception, and processing, there has been an explosion of inquiries into a range of issues on the natureculture continuum, including music's evolutionary origins and biological basis and the comparison of the faculties of music and language. Cognitive musicology ...biomusicology ...ecomusicology ...evolutionary musicology ...ornitho-musicology ...zoömusicology. A number of new words describe lively areas of research interest. Coined in 1983 by French composer François-Bernard Mâche, zoömusicology studies the musical aspects of animal sounds. According to Mâche, "If it turns out that music is a widespread phenomenon in several living species apart from man, this will very much call into question the definition of music, and more widely that of man and his culture, as well as the idea we have of the animal itself” (1983/1992: 95). I suggest a provisional definition: zoömusicology is the human valorization and analysis of the aesthetic qualities of non-human animal sounds. Cognitive musicology ...biomusicology ...ecomusicology ...evolutionary musicology ...ornitho-musicology ...zoömusicology. A number of new words describe lively areas of research interest. Coined in 1983 by French composer François-Bernard Mâche, zoömusicology studies the musical aspects of animal sounds. According to Mâche, "If it turns out that music is a widespread phenomenon in several living species apart from man, this will very much call into question the definition of music, and more widely that of man and his culture, as well as the idea we have of the animal itself” (1983/1992: 95). I suggest a provisional definition: zoömusicology is the human valorization and analysis of the aesthetic qualities of non-human animal sounds. Simpler still, zoömusicology is the study of music in animal culture. 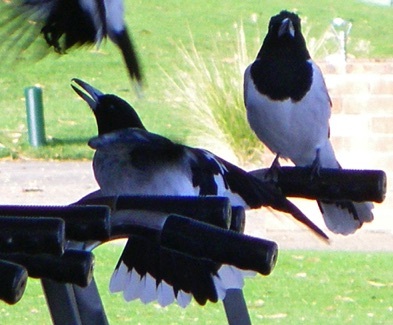 A pied butcherbird trio (Cracticus nigrogularis) (© Hollis Taylor).